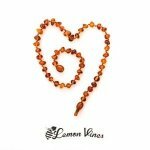 Made from the natural amber in rich brown or cognac, this beautiful necklace is 29 cm in length and is perfect for children up to 12 months in age. The necklace is fitted with a pop clasp, quick release closure for safety. 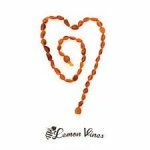 Made from the one of the lightest amber available, this beautiful necklace is 29 cm in length and is perfect for children up to 12 months in age. The necklace is fitted with a pop clasp, quick release closure for safety. 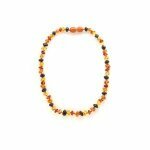 Alternating honey, light cognac, cherry and dark cherry beads make this beautiful necklace appealing to any age and gender! This necklace is 29cm in length and is fitted with a pop clasp, quick release closure for safety. 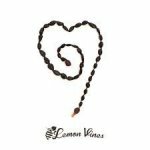 A Lemon Vines exclusive! 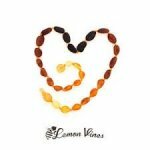 These baby teething necklaces feature beads honey and cognac and cherry with a cognac amber pendant as the centerpiece. Strung with knotted cord so that you never have to worry about losing all of the beads. These necklaces are 29cm in length and will fit up to 12 months in age. This necklace is fitted with a pop away safety clasp. 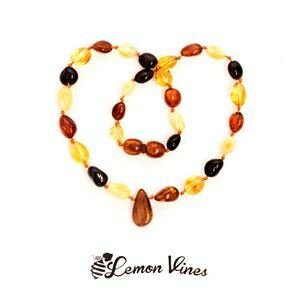 Possess the many positive qualities of amber with this necklace, which has beads that feature beautiful unpolished deep cherry colored beads— less shiny then their polished counterparts but just as beautiful. This is a small size, perfect for children up to 12 months. 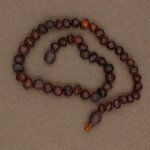 Each bead is individually knotted and the necklace features a pop away safety clasp. 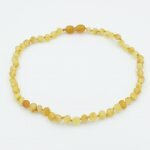 For teething babies, amber's healing properties will reduce inflammation and calm the baby, without resorting to over the counter medications. All of our teething necklaces are finished with softly rounded shapes and a pop safety break away clasp. Each bead is individually knotted onto the necklace, to ensure your child's safety.